Easily convert MP3 to Ringtones online, by uploading a file, playing it, selecting start/end points, possibly editing, e.g. 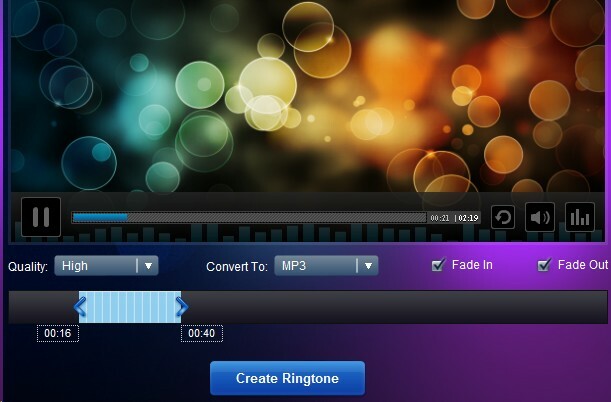 by reducing the file size, fading in or out, then create a ringtone. Download either to your mobile phone or computer, to transfer via blue-tooth or USB. Any conversion though, may be better described as modifying, since the output file is generally a MP3 (again). However, there are options to convert to other formats, such as WAV, WMA, or OGG. But of course you can create your own Ringtones by simply recording to your phone, or by applying editing and conversion software. This might include Audacity, Cool Edit Pro 2 (e.g. 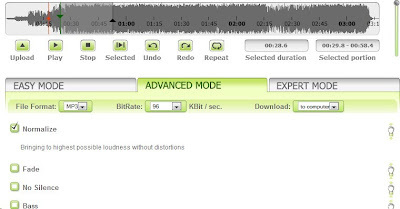 for increasing volume, sample rate reduction, noise limiting, fading, etc) and specific converters, depending on required file formats, such as WAV to SMAF for Samsung (.mmf files), plus other software to create formats for AAC, Midi, IMelody, Nokia, etc. I'm sure plenty of us have been through all sorts of manual conversions, including searching and downloading melody codes, or creating them on earlier version mobiles. But easier uploading MP3's to create an instant truncated file. I have tested, and become familiar with dozens of software audio tools, and these days I just like, uploading/downloading on the internet in some instances. Though you might have to sign up for some online converters, so maybe try to see what benefits might be involved. * Sharing/Downloading from the converter site - Including your own, and others that are available from recent conversions. * Some sites have forums, addons, software, tutorials, etc. Thus benefits for some. Upload your audio file including OGG, WMA, ACC, MP4, then move the triangle markers to set your music clip range, set sound quality (bit rate default at 96 KBit/sec), and filters. Play and then make a ringtone. You can select from basic, advanced and expert mode. These include filters such as fade, bass, treble, reverse, echo, reverb, high-pass, low-pass and more. Once you click those features, addition features/choices can be selected, such as frequency factors, delays, duration, intensification, and more. Hence you can further refine your audio track. Overall a nice friendly, attractive conversion web site with a good range of editing options. It seems easy to create a MP3 clip, to save to your computer, then transfer to mobile phone. Also can search their site for news, videos, and photo's relating to songs, albums, and artists. Requires creating an account. Sleek website to upload your MP3 file or enter a YouTube url to create a ringtone. Select a fragment, by dragging the blue highlighted section, which seems fixed at 30 seconds. Play will auto loop within that blue section. Has fade in/out. Hence easy and quick to move the section to select your music clip. Then click download for your phone, including the iPhone. There are also other ring tones, video audio, featured artists, popular categories, and more to select from their website. Simply upload then quickly convert, supporting quite a few formats, e.g. FLV, AIFF, MIDI, M4A and other formats. Displays an attractive player, with fade controls, quality level, and conversion type, e.g. MP3, to produce a quality sound. Simple player to quickly select a sub section (i.e. clip) for your new MP3 file, then to generate a tone, and also includes a shortened url link, available for a few days. You can also play and download other ringtones, which I think are from recent conversions. Generally the above free converters all produce good output, though some have more addons than others, but all fundamentally producing quality sound. Whether from Video or MP3 audio, it can be extracted similar to Youtube to MP3 Converters Online, but clipped and filtered to produce a suitable file size ringtone for playing on a mobile phone.